When it comes to taking notes in class, the question everyone seems to be debating is tech or no tech? A friend and university professor recently posted this article to her Facebook feed: The Benefits of No-Tech Note Taking from the Chronicle for Higher Education. In this piece, a professor reflects on life the year since banning laptops for note taking. The comments on my friend’s post generally praised the article and included criticisms of technology being used in classrooms (specifically secondary and higher ed classrooms). I can appreciate people relying on the tool that works best for them and I am pleased when educators are reflecting on technology’s role in their own and their students’ lives. What worries me about this (and so many ed tech integration-related conversations) is the all or nothing stance. Technology is best used to improve our lives and redefine* what’s possible for each of us. And in most cases, this means a blending of what has worked well (no/low-tech) with emerging practice (previously inconceivable). Researcher: conducts further research about the content and adds in links, definitions, etc. Question Catcher: captures all of the questions raised during the lecture / class. The researcher or others could then look in to these or take the necessary action (asking the instructor). Define key vocabulary / pronunciations / translate: This can be especially helpful for acronyms. Observations on group dynamics: How often or much people speak, who gets called on, etc. Having this structure allows the old school note takers to scratch & doodle away, but provides all students with the amazing benefit of having SEARCHABLE notes. This also encourages collaboration. This approach allows students to create rich and robust study guides. For someone like me (with ADD), I benefit greatly from this sort of process. My role is defined and limited (so I can still engage) and it alleviates the anxiety I get when trying to simultaneously synthesize & document info. I don’t mind taking any of these roles on, but sometimes I prefer to use a traditional or a Sketchnote approach and having this as a more formal/ searchable fallback is ideal. For people using Google Apps for Education, we recommend creating a structure for your students before sending them in to a single live document. You are welcome to use or modify the sample Google Docs template we use with teachers and students. We would love to hear how you structure collaborative note taking! Please share in the comments. 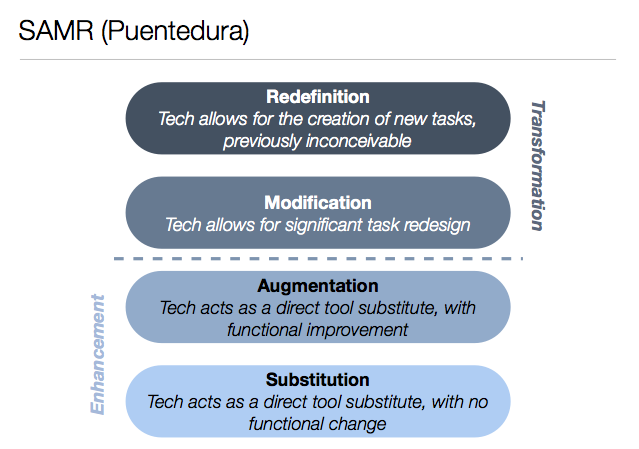 *I’m using “redefine” here in the sense of Puentedura’s SAMR Model. Here is an overview of SAMR from Common Sense Media. You can also check out Rueben Puentedura’s website.